Agility is one of the slowest and most monotonous skills to train in OSRS, but it provides some very beneficial uses. As you level your skill, you will have increased run energy as a permanent boost. There are a few alternate ways to train the skill, but the majority of your agility training in OSRS will take place on various agility courses. Rooftop courses will be an important part of your agility journey, as you’ll collect Marks to buy the Graceful set, or use for profit. Before you begin your training, note that the first 32 Agility levels may be skipped by questing. Completing the following quests in order will net you enough experience to jump directly to level 32 Agility: Recruitment Drive, The Tourist Trap (use your reward tomes on Agility), and The Grand Tree. This is highly recommended if your account type is able to complete the quests. Should you choose to skip over these quests, or your account type isn’t able to complete them (i.e. a Skiller), you’ll need to start elsewhere. Head to the Tree Gnome Stronghold northwest of Ardougne, complete this course until you reach level 10. Starting with 0 experience, it will take you about 14 laps to reach level 10 Agility. If you find yourself low on run energy while running laps, consider bringing a few 4 dose energy potions. 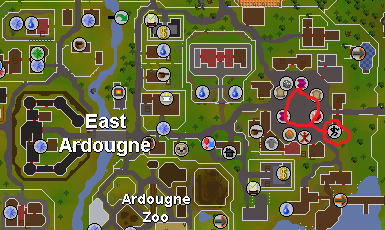 Ardougne teleport (or tab), run northwest. Buy a Grand Seed Pod from the GE, use it to teleport directly to the top of the Gnome Stronghold glider area. Spirit Tree teleport, GE is the easiest to reach. Gnome Glider system may be used from any other Glider location. From here on out, you will be using Rooftop courses for the majority of your training. 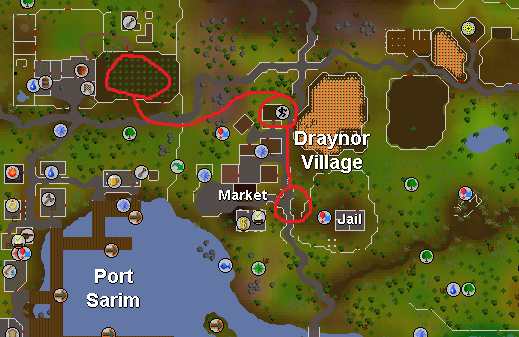 The first location is the Draynor Rooftop course. Depending on your Hitpoints level, you may need to take some food for the fall damage. You may also opt to buy a Regen Brace which works well for many of these courses. From this point on, you will start to receive Marks of Grace at random while training. Make sure to pick up every one you find, they will be extremely useful later. Starting at level 10, it will take you about 28 laps to reach level 20 Agility. Each complete lap rewards you with 120 experience. Amulet of glory teleport directly to Draynor. Draynor Manor teleport from the Arceuus spellbook. Must have at least 60% Arceuus House favor to use. Explorer’s Ring 2 or higher for the Cabbage Teleport. The next tier of Rooftop course is located in Al Kharid. Some players opt to continue using the Draynor Rooftop course until 30, because this one is roughly the same xp/hr without Energy Potions. You’ll receive a very slight boost in xp rates if using potions, but only about ~350 more per hour. Starting at level 20, it will take you about 50 laps to reach level 30 Agility. Each complete lap rewards you with 180 experience. Amulet of glory teleport directly to Al Kharid palace. Use the home teleport spell to Lumbridge. Run east to the toll gate, this requires 10 coins to if you haven’t completed Prince Ali Rescue. Ring of Dueling teleport to the Duel Arena, then run south to the starting point of the Agility course. Varrock is the next stop in our Agility training. We’ll be using this course from levels 30 to 40, or 32 to 40 if you chose to do the recommend quests mentioned in the beginning. This course is fairly long, but simple. If you have over 20 Hitpoints, you won’t need to bring any food items along with you. As usual, make sure to keep collecting your Marks of Grace. Starting at level 30, it will take you about 200 laps to reach level 40 Agility. Each complete lap rewards you with 238 experience. Varrock Teleport tab or spell. This will put you almost directly beside the start of the course. Amulet of Glory teleport to Edgeville. 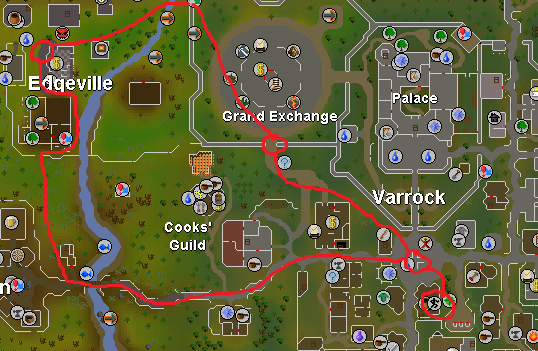 Run through the GE shortcut or around Barbarian Village into Varrock. Ring of Wealth teleport to the GE, run south east to the starting point of the course. Next up on our Rooftop journey is the Canifis course. You have a few different options here depending on how you want to train your Agility. The Canifis course between levels 40-60 offers some of the fastest Marks of Grace possible. If your goal is to achieve full Graceful, I’d recommend that you stick here for these levels. Don’t care about Marks of Grace? At level 47, you can use Summer Pies to boost your level enough to use the Wilderness course. You can use the course without Summer Pies starting at level 52. This will be better xp/hr than the Canifis course, but offers no Marks of Grace at all. Starting at level 40, it will take you about 986 laps to reach level 60 Agility. Each complete lap rewards you with 240 experience. Run far east from the Varrock fountain to Paterdomus. Travel under the temple and into Canifis. After the Ghost’s Ahoy quest, use the Ectophial teleport and run west. 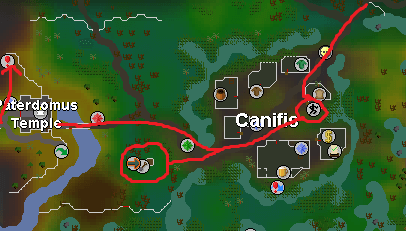 Use the Fairy Ring code C-K-S to teleport just east of Canifis. This alternate method to level 60 is much faster, but will not yield any Marks of Grace. The Wilderness also comes with a risk of PKers, but generally you won’t be bringing any items in, so the risk is minimal. The course requires level 52 to start, but you can use Summer Pies to give you a +5 Agility boost temporarily to begin training earlier. Starting at level 47, it will take you about 348 laps to reach level 60 Agility. Each complete lap rewards you with 571.4 experience. The fastest way to the Wilderness course is to pull the lever in Edgeville or Ardougne to reach the Deserted Keep. 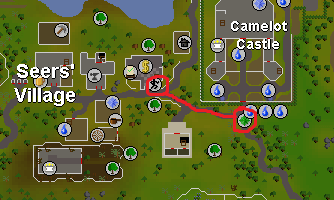 Run east past Mage Bank to reach the course. Remember to bring a Knife or weapon to slash the webs. Upon completion of the Kandarin Hard Diary, the Seers’ Village course is the best training method from level 60, all the way to 90. This diary rewards you with the ability to set your Camelot teleport directly to Seers’, right beside the start of the Agility course. You’ll be able to receive an upwards of ~54k xp/hr using this method. Simply use the teleport after each complete lap to entirely skip the run distance between laps. If you do not, or can not complete this diary, only stay here until level 70 before moving onto the next available Rooftop course. If you complete the diary at a later point, you can always come back to this method until level 90. Starting at level 60, it will take you about 8,900 laps to reach level 90 Agility, or 814 laps to level 70. Each complete lap rewards you with 570 experience. 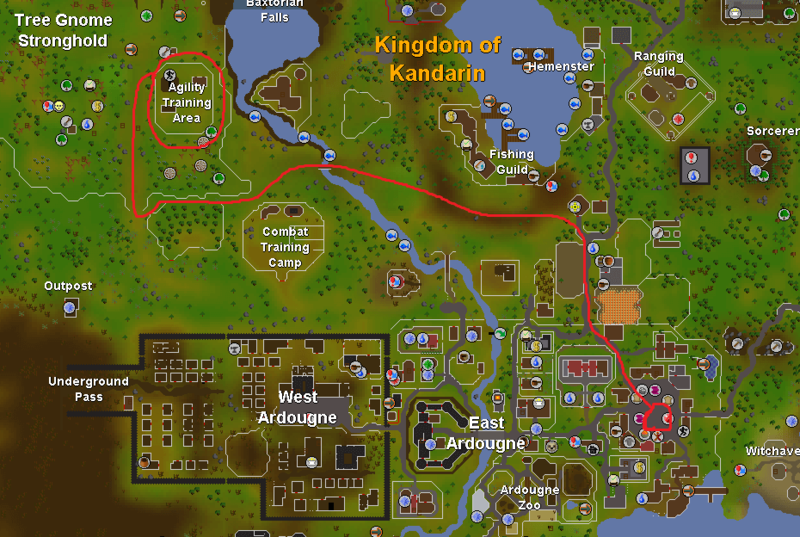 Camelot teleport and run west, with the Kandarin Hard Diary complete you can set this to a location directly beside the start of the course. Without the Kandarin Hard Diary, we’ll move onto the Pollnivneach course. At this point, you should get the gist of the skill. There’s nothing special to note about this course, other than continuing to collect your Marks of Grace. Starting at level 70, it will take you about 1,403 laps to reach level 80 Agility. Each complete lap rewards you with 890 experience. 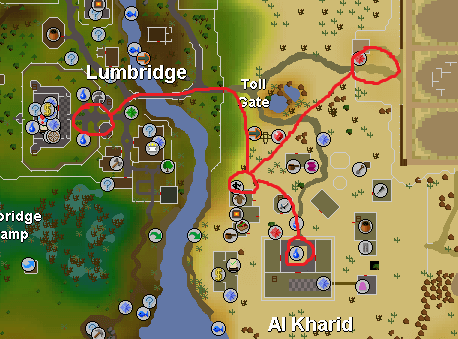 Use an Amulet of Glory or Ring of Dueling to teleport to Al Kharid. Run south towards Shantay Pass and travel to Pollnivneach using the magic carpet for a small fee. Set your Player Owned House to the Pollnivneach location. You can then use a house teleport to reach this area easily. Change your house settings to toggle your teleport outside of the house, this way you can avoid the loading screen. Create a Pollnivneach Teleport by using a Scroll of Redirection on a normal House Teleport tablet. The Rellekka Rooftop course will provide you with roughly ~51k xp/hr. Continue to collect your Marks of Grace as you train. Again, this is a very basic course that doesn’t need much explained. Experience rates here are still slightly lower than Seers’ with the Kandarin Hard Diary. Starting at level 80, it will take you about 4,309 laps to reach level 90 Agility. Each complete lap rewards you with 780 experience. 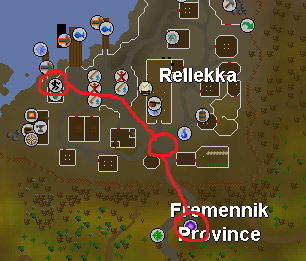 The Enchanted Lyre from the Fremmenik Trials quest can be used to teleport directly to Rellekka. Set your Player Owned House to the Rellekka location. You can then use a house teleport to reach this area easily. Change your house settings to toggle your teleport outside of the house, this way you can avoid the loading screen. Here we are, the final big push to that coveted skillcape! Using this course, you’ll be able to receive approximately 62k xp/hr, along with some epic profit. If possible, try to complete the Ardougne Elite Diary before starting here, as this will net you 25% more Marks of Grace during your training here. Starting at level 90, it will take you about 9,695 laps to reach level 99 Agility. Each complete lap rewards you with 793 experience. Ardougne teleport (or tab). This is the only recommened method as tabs and runes are cheap, and it teleports you right beside the start of the course. Congrats on your 99! Agility, while being an incredibly easy skill to train, can be a painful and mind-numbing grind. Now that you’ve hit the max level, let’s go get your Skillcape! You can purchase it for 99,000 coins from Capn’ Izzy No-Beard at the entrance to the entrance to the Brimhaven Agility course. Here are some fun tips and tricks that you may also use along your journey to 99 Agility. You’re able to train it using some other non-conventional methods to create accounts with specific builds or stats. Your Marks of Grace can be almost directly turned into GP. Head over to Grace in the Rogues Den. You can purhcase Amylase Packs, containing 100 Amylase Crystals each for 10 Marks of Grace. These are used to make Stamina potions, and are worth ~1k gp each. You can train Magic at the same time as almost any Agility course using the High Alchemy spell. With use of the proper items, you can even make a profit through this method on top of money earned through trading in your Marks of Grace. Alternatively, you can cast Magic Imbue or Fletch bolts/darts/arrows while running laps. If you do this early on and throughout your Agility training, you’ll get a hefty amount of Magic or Fletching experience while getting 99 Agility. Barbarian Fishing will grant you a small amount of Agility and Strength experience while training. 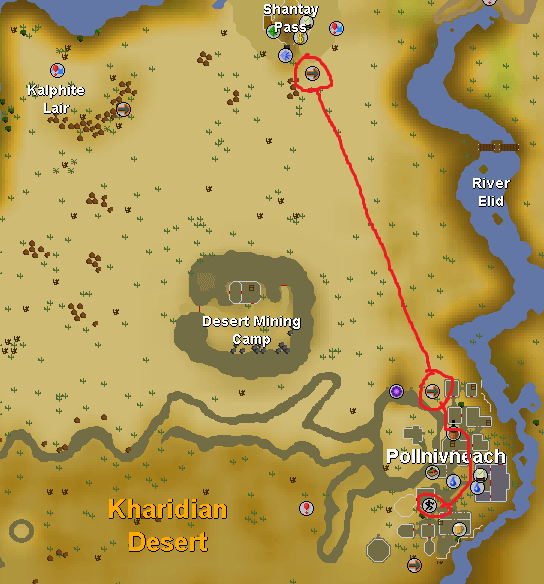 If you plan on maxing out completely, it is advised to do this method of Fishing to 99 first, as it will boost your Agility from level 31 (required to start this method) to 74. This eliminates a large portion of regular training, but means you will not have a full Graceful set until a much later point.